We struggle to stay psychologically alive amidst the paralyzing realities of our everyday personal and professional existence. According to philosopher Bernard Stiegler, the only “life worth living” is immersion in the struggle against the unreflective stupidity, the “proletarianization of the mind,” to which we all have become inured by the hurly-burly of technics and late-state capitalism (2013). Could our struggle become more meaningful? What would be the basis of this kind of struggle? Certainly, in-depth reflection must be the basis of any level of authentic engagement. Eminent psychoanalysts Ladson Hinton, MD (USA) and Hessel Willemsen, DClinPsych (UK), the co-editors of Temporality and Shame: Perspectives from Psychoanalysis and Philosophy (Routledge, 2017), have engaged the creative minds of scholars from diverse disciplines of anthropology, philosophy, psychoanalysis, critical theory, cultural studies, literature, and theology, in working together to produce this timely and urgent volume. 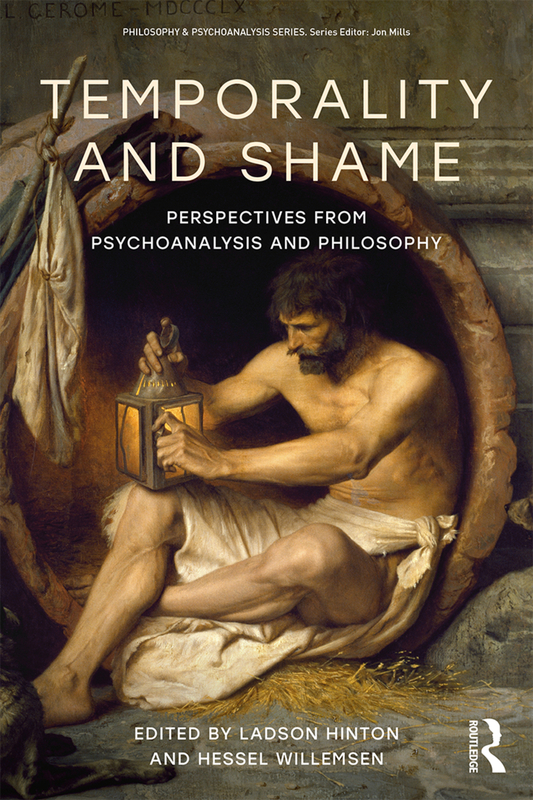 Until now, the intersection of shame and temporality has been a largely neglected area of study, segregated within two separate disciplines of psychoanalysis and philosophy. From one perspective, we discover the inter-relationship of our human responses to unimaginable misery and trauma, when the flow of time and memory is often frozen, along with the incapacity of victims and perpetrators to bear the shame and the truth of the other’s–or their own–suffering. However, considered from another perspective, shame can be our greatest teacher and healer, and the re-collection of memories can open the flow of life into future possibilities. Hinton and Willemsen’s book is also a response to the grave atmosphere of our times. The chaotic tension in our nation and world tends to obscure all reasoned discussion. There is a sense that we are no longer hanging onto the lip of the abyss but have fallen over it. Amidst these multiple pressing concerns, a central goal of this event is to provide a space for thoughtful engagement that will enhance a reflective and respectful discourse. Diogenes (412-323 BC), a Greek philosopher who carried a lantern, always looking for an honest man. He loved dogs because of their honesty. 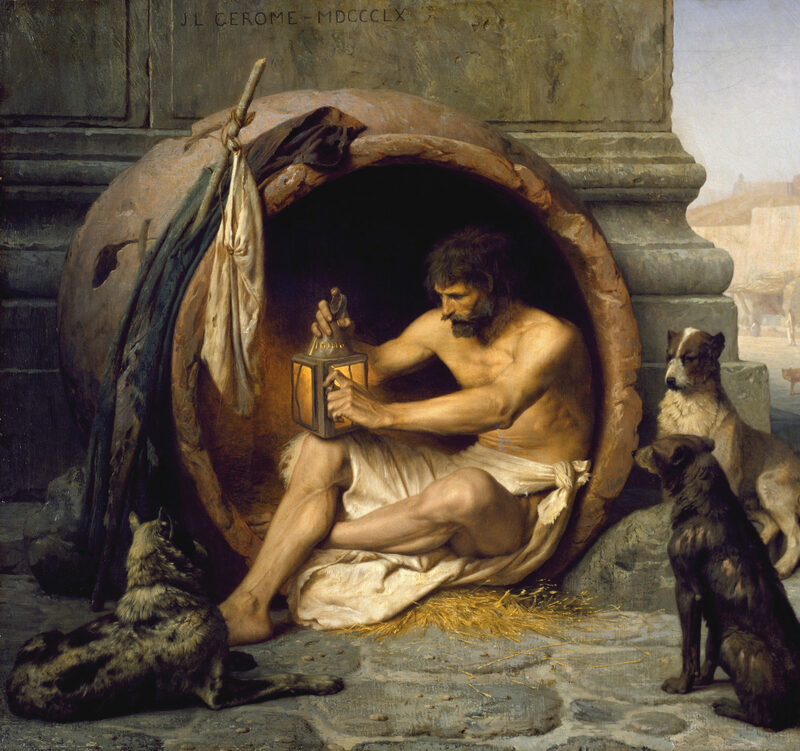 “Diogenes”, 1860, Jean-Léon Gérôme. Public domain. There will be morning and afternoon sessions where the co-editors, along with three chapter authors, Sharon R. Green, Alexander Laban Hinton, and Eric Severson, will be present. They will all describe some of their contributions to the book’s theme of shame and temporality, providing a springboard for dialogue about this critical moment in time and history. These presentations will engage our deepest concerns about the basic ground of what it means to be human in our troubled times, seen through the authors’ multi-disciplinary lenses, and we hope this will stimulate your thoughts and questions. Presentations and responses by Drs. Hinton and Willemsen, followed by generous time for audience participation comprise the first half of the program. Ladson Hinton trained in psychiatry at Stanford and served on the Stanford Clinical Faculty for twenty years. He is a graduate of the C. G. Jung Institute of San Francisco, and is a member of the Society of Jungian Analysts of Northern California, the International Association for Analytical Psychology, the Institute for Contemporary Psychoanalysis in Los Angeles, and a founder of the New School for Analytical Psychology in Seattle. He serves on the editorial board of the Journal of Analytical Psychology, and practices, consults and teaches in Seattle. In 2009, he received the Award for Distinguished Contributions to Psychoanalytic Education from the International Forum for Psychoanalytic Education and was nominated for the 2016 Gradiva Award for his article, ‘Temporality and the torments of time’ in the Journal of Analytical Psychology. Recent interests and publications are in the areas of French psychoanalysis, truth and shame, temporality, and the historical and philosophical grounds of psychoanalysis. Hessel Willemsen studied chemistry at Delft University, clinical psychology at Leiden University and completed his analytic training at the Society of Analytical Psychology (SAP), London, where he is a Training Analyst. He is on the editorial advisory board of the Journal of Analytical Psychology. A member of the International Association of Analytical Psychology he practices, teaches and consults in London. Recent interests include affect, the body, time, temporality and philosophy and the work of Primo Levi. He has published and taught on affect and the body. Alexander Laban Hinton, PhD, Eric Severson, PhD, Sharon R. Green, MSSW, present their work for the afternoon program, with panel response, audience discussion and questions. Alexander Laban Hinton, PhD (US), is director of the Center for the Study of Genocide and Human Rights, Professor of Anthropology, and UNESCO Chair in Genocide Prevention at Rutgers University. He is the author of the award-winning Why Did They Kill? Cambodia in the Shadow of Genocide (University of California Press, 2005) and nine edited and co-edited collections. His most recent book, Man or Monster? The Trial of a Khmer Rouge Torturer, was published with Duke University Press in the winter of 2016. In recognition of his work on genocide, the American Anthropological Association selected Hinton as the recipient of the 2009 Robert B. Textor and Family Prize for Excellence in Anticipatory Anthropology. Professor Hinton is also a past president of the International Association of Genocide Scholars (2011–13) and was a member/visitor at the Institute for Advanced Study at Princeton (2011–13). In 2016, he served as an expert witness at the Khmer Rouge Tribunal. Eric Severson, PhD (US), is a philosopher specializing in the work of Emmanuel Levinas. He is the author of the books Levinas’s Philosophy of Time (Duquesne University Press, 2013) and Scandalous Obligation (Beacon Hill Press, 2011), as well as editor of several other works. He lives in Kenmore, Washington, with his wife Misha and their three children, and currently teaches philosophy at Seattle University. Sharon Green, MSSW (US), has a private practice of psychoanalysis and clinical consultation in Seattle, Washington. Sharon’s analytic work and teaching reflect her commitment to analysis as a dialogic process that transcends any particular theory or dogma. She is a member of the International Association of Analytical Psychology and a founding member of both the New School for Analytical Psychology and the Lacanian Study Group of Seattle. Her reviews and articles have appeared in the Journal of Analytical Psychology and she has presented at numerous international conferences. Current interests include the intersection of ethics and psychoanalysis and the impact of globalization and neo-liberalism on these contemporary subjects. This workshop has been approved for 5 hours of CEUs by the Washington Chapter, National Association of Social Workers (NASW) for Licensed Social Workers, Licensed Marriage & Family Therapists and Licensed Mental Health Counselors. Provider number is #1975-259. To better understand the connection between ethics and temporality. To better understand the connection between ethics and shame. To better understand the notion of nothingness and its relationship with temporality and shame. To gain insight into how often-unrecognized assumptions about the nature of temporality and shame shape the analyst/therapist’s understanding of the goal of psychoanalytic treatment and its ethical dimension. The participant should gain a more nuanced understanding of the history and development of shame, particularly in distinction from guilt. The participant will be able understand how understandings of temporality may vary cross-culturally. Shame slows us down so that we can become more open to the full dimensionality of our experience. This especially includes temporal dimensions, such as debt to our ancestral heritage and imagining a different future. Such deepened reflection can evoke a fuller presence in our surround, and a more critically-held engagement in our intersecting worlds of experience. The authors who contributed to the diverse chapters in Temporality and Shame are from the disciplines of philosophy, Eric Severson (USA), Jon Mills (Canada) and Daniel Ross (Australia); cultural studies, Daniel Ross (Australia); anthropology, Alexander Laban Hinton (USA), psychoanalysis, Ladson Hinton (USA), Sue Austin (Australia), Angela Connolly (Italy), Sharon R. Green (USA), Jon Mills (Canada), Murray Stein (Switzerland), Michael Whan (UK) and Hessel Willemsen (UK). Our School embraces education as a never-ending dialogical process that does not hold fast to a single theory or ideology. Our approach to knowledge is one that honors the ancient yet emphasizes our embeddedness in a contemporary cultural context. An ethical obligation to the ‘other’ is a prime concern. Our profession faces complex conditions of suffering and evolution, and each journey has a unique destiny that cannot be known in advance. The inherent ambiguity of our field creates anxiety in its practitioners, and there is a tendency to withdraw into defensive bastions of theory and practice. The New School group shares a deep concern about the fundamentalist tendencies in all analytic schools. We value the scholarship and clinical approaches of multiple traditions with their unique perspectives on our ever-fascinating, ever-evolving field of reflective endeavor.